Royal Ascot never fails to amaze as it draws in spectacular crowds from around the world on the opening day of this historic event. The highly anticipated onset from Her Majesty The Queen sets the tone for a tremendous day of tradition and entertainment at Royal Ascot. 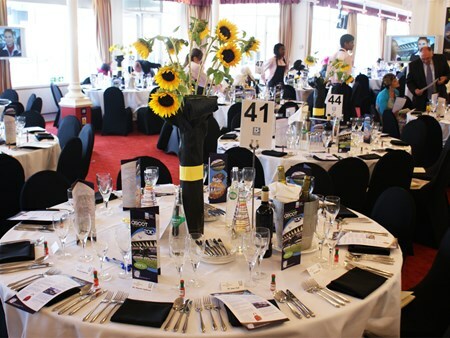 The vibrant atmosphere, beautiful surroundings and glamourous racegoers is the perfect setting for a day at the races. 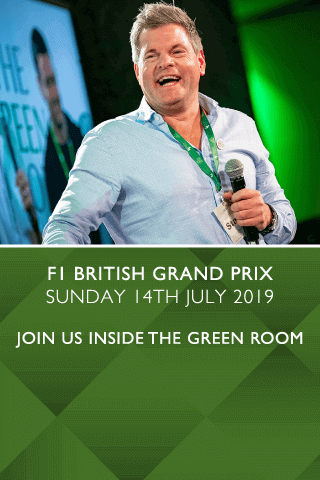 Day one of Royal Ascot features three of the most acclaimed Group 1 races in the World: The Queen Anne Stakes, The King's Stand Stakes and The St James' Palace Stakes, providing guests with ample opportunity to have a flutter during the day's racing. 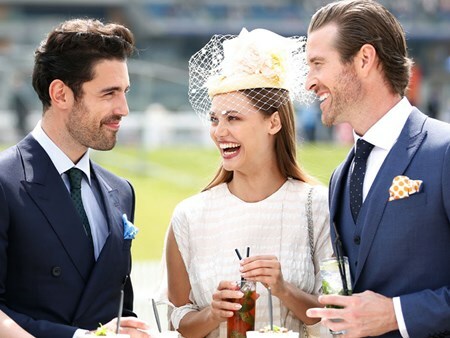 There is no finer way to experience the refined splendour of Royal Ascot than with Ascot Racecourse corporate hospitality, where guests can relax in their luxurious surroundings and soak up the atmosphere of the most high profile event in the history of racing. 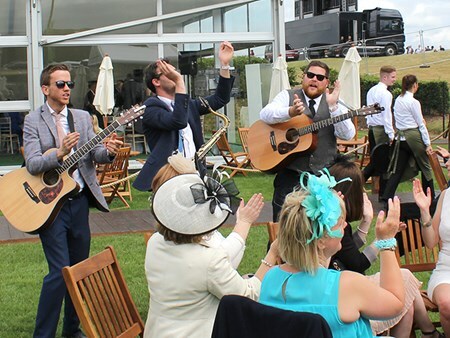 Overlooking the Plaza Lawns and traditional singing around the famous Bandstand, the Pavilion is the place to soak up the atmosphere at Royal Ascot. You will be able to enjoy the sights and sounds with a glass of prosecco on arrival from a private balcony, watching racegoers pass by in their finery. The Grandstand and Parade Ring are just a short stroll away once racing begins. Bookings are available for shared tables of 10 guests. The luxurious Royal Ascot Village is ideally positioned in the centre of the course, giving guests panoramic views alongside the final furlong, facing the stunning new Grandstand. The Royal Ascot Village offers a facility close to the action, inside the racetrack, with access across the track into the new Grandstand. Private chalets are available for 30+ guests, or tables of 10 in the restaurant. Smaller groups will be accommodated on a shared basis. Ascot Village dress code information can be found here. 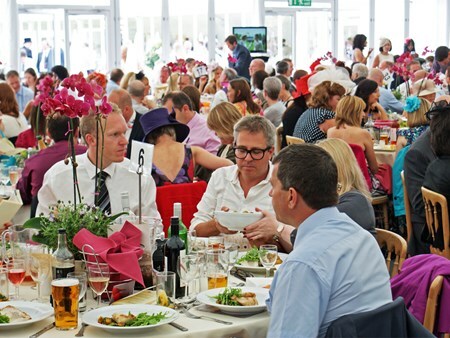 Situated metres from the track, just beyond the east end of the Grandstand, the ideally located Lawn Club offers superb hospitality. You and your guests will be able to enjoy a four course buffet, complimentary bar in addition to access into the Queen Anne Enclosure. Private tables are available for 8 and above. Shared tables of 10 also available. 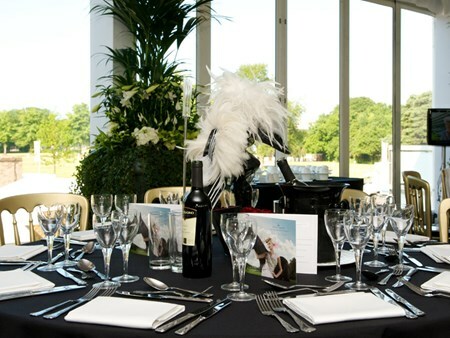 Ascot Racecourse's Furlong Club is superbly situated over-looking the course, around the 2-furlong marker, with viewing available via a private decked terraced area. You and your guests can relax in the casual dining area whilst you take in all the action from the races. Private tables are available for 2 - 12 guests. Introducing the exciting new On5 Restaurant at Royal Ascot. The focus of this exclusive space is based on five craftsmen: the farrier, the trainer, the groom, the saddler and the jockey - affording you a refined glimpse of the graft behind the Royal Ascot glamour. 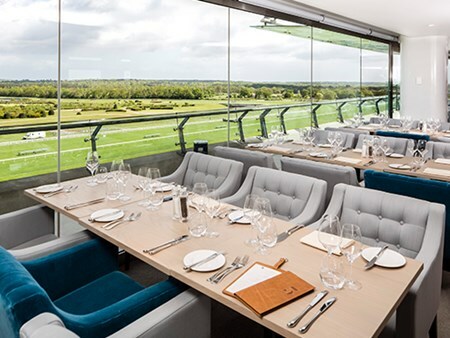 Located at the west wing-end of the Grandstand, this restaurant will be the first restaurant available for Grandstand Admission racegoers with menus presented by a Michelin Star chef. This restaurant has superb trackside viewing ideal for cheering the Royal Party as the state landaus comes down the Track. This is also the perfect location to view the horses as they thunder past the stand towards the Winning Post. This exciting new facility offers you the opportunity to book a private table for groups of between 2 and 12 guests. On5 Restaurant dress code can be found here. A celebration of the effortless and timeless style of Royal Ascot, the experience will be presented, for the first time in the UK, by the talented chefs from Paris. Situated on the first floor of the double decker luxurious marquee, Carriages offers uninterrupted views across the racecourse, making this is a perfect restaurant from which to enjoy a spectacular day at Royal Ascot with friends or colleagues. Bookings are available for private tables of 10. Smaller numbers will be on a shared basis. Carriages Restaurant dress code information can be found here. Can't find your favourite Royal Ascot - Tuesday package?